The Empire Style, sometimes considered the second phase of Neoclassicism, is an early-19th-century design movement in architecture, furniture, other decorative arts, and the visual arts. The style originated in and takes its name from the period when Napoleon I ruled France , known as the First French Empire, where it was intended to idealize Napoleon's leadership and the French state. The style corresponds to the Biedermeier style in the German-speaking lands, Federal style in the United States and to the Regency style in Britain. An earlier phase of the style was called the Adam style in Great Britain and "Louis Seize" or Louis XVI, in France. The Empire style was based on aspects of the Roman Empire and its many archaeological treasures which had been rediscovered starting in the 18th century. The preceding Louis XVI and Directoire styles employed straighter, simpler designs in comparison with the Rococo style of the 1700s. Empire designs heavily influenced the American Federal style (such as the United States Capitol building), and both were forms of propaganda through architecture. It was a style of the people, not ostentatious but sober and evenly balanced. The style was considered to have "liberated" and "enlightened" architecture just as Napoleon "liberated" the peoples of Europe with his Napoleonic Code. The Empire period was popularized by the inventive designs of Percier and Fontaine, Napoleon's architects for Malmaison. The designs drew heavily for inspiration on symbols and ornaments borrowed from the glorious ancient Greek and Roman empires. Buildings typically had simple timber frames and box-like constructions, veneered in expensive mahogany imported from the colonies. Biedermeier furniture also made use of ebony details, originally due to financial constraints. Ormolu details (gilded bronze furniture mounts and embellishments) displayed a high level of craftsmanship. General Bernadotte, later to become King Karl Johan of Sweden and Norway, introduced the Napoleonic style to Sweden, where it became known under his own name. The Karl Johan style remained popular in Scandinavia even as the Empire style disappeared in other parts of Europe. France paid some of its debts to Sweden in ormolu bronzes instead of money, leading to a vogue for crystal chandeliers with bronze from France and crystal from Sweden. After Napoleon lost power, the Empire style continued to be in favor for many decades, with minor adaptations. There was a revival of the style in the last half of the 19th century in France, again at the beginning of the 20th century, and again in the 1980s. 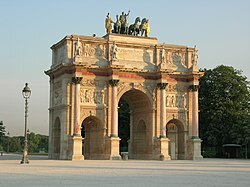 The most famous Empire-style structures in France are the grand neoclassical Arc de Triomphe du Carrousel , Vendome column , and La Madeleine , which were built in Paris to emulate the edifices of the Roman Empire. The style took particular root in Imperial Russia , where it was used to celebrate the victory over Napoleon in such memorial structures as the Russian Admiralty , Kazan Cathedral , Alexander Column , and Narva Triumphal Gate . Stalinist architecture is sometimes referred to as Stalin's Empire style. The style survived in Italy longer than in most of Europe, partly because of its Imperial Roman associations, partly because it was revived as a national style of architecture following the unification of Italy in 1870. Mario Praz wrote about this style as the Italian Empire. In the United Kingdom , Germany , and the United States , the Empire style was adapted to local conditions and gradually acquired further expression as the Egyptian Revival, Greek Revival, Biedermeier style, Regency style, and late-Federal style.